Expand your space with style and make your front porch a welcoming area that adds to the home’s curb appeal! With a new emphasis on more walkable streets and communities, many housing developments are incorporating friendly front porches as part of their design. And most existing homes can be remodelled to include a front porch, which adds both style and value as it expands living space. If you are lucky enough to have a home with a front porch, style it for spring and enjoy outdoor living. A few simple changes can help a porch live up to its potential! Even a modest concrete porch can be refined without replacing. Use a concrete paint available in colours and textures that mimic the look of expensive stone without the cost. Wooden floors look more finished with a simple rug – sisal or jute rugs can define the space and will rinse off with a hose when they get dirty. A canvas floor cloth adds pop, painted to complement the decor. Using a rug will anchor a seating or porch dining area while adding a little softness underfoot. Adding plants and flowers to a porch is the least expensive way to up the curb appeal. Make your plant selections to take advantage of the amount of light your porch gets and group pots in house-accenting colours around the space; or, use hanging plants to bring interest to windows and eaves. Lacy ferns soften the lines and brightly blooming plants make a cheery welcome. A large porch almost demands a porch swing! Or, consider a living-room arrangement of seating with pieces in wicker or rattan — weatherproofing treatments allow these items to stand up well to the elements. A small loveseat with a pair of chairs and a low coffee table invite conversation and casual snacks. A rocker or a big, comfortable wicker chair are perfect places to settle to watch the neighborhood action! A small picnic table is informally welcoming and lures friends and neighbours to stop for a snack. Don’t ignore the house walls as you style your porch for spring. Vintage signs, wrought-iron accents or a planter are great decor… or, mount a birdhouse to bring more of the garden theme up onto the porch. Floral seat cushions and a soft throw make the porch a comfy place to relax and mingle. Wicker baskets corral magazines and small toys while adding texture. Look to indoor decorating for style elements to add to your porch: pottery, figurines or antique pieces transition nicely to a porch area. 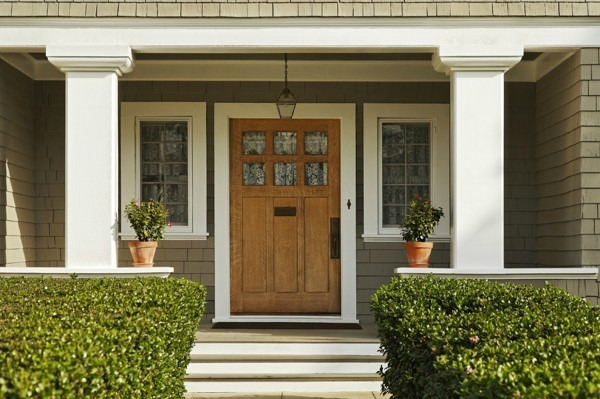 For finishing touches, get new street numbers, an updated welcome mat or a new porch light. The details you incorporate on the porch won’t cost a fortune, but will add a tremendous amount of curb appeal!